New York indie-punk band Les Savy Fav’s lat­est release was sched­uled to hit shelves on the 14th, although it end­ed up being released ear­li­er due to an extreme­ly ear­ly leak. Release curiosi­ties aside, Root for Ruin is an inter­est­ing, if not par­tic­u­lar­ly great album. 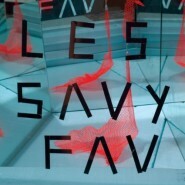 It’s clear­ly Les Savy Fav, and at the same time a clear devel­op­ment in the band’s evolv­ing style. It’s good to see that Les Savy Fav is far from stag­nat­ing, Root for Ruin being the band’s fifth album; still, it would have been even nicer had Root for Ruin been a ter­rif­ic album. Front­man Tim Harrington’s vocals are unsur­pris­ing­ly quite in line with Les Savy Fav’s sound - half Mclusky-ish punk and half rel­a­tive­ly stan­dard rock. But what­ev­er the mix of Harrington’s vocals across Root for Ruin - not con­stant across the album, but rather flu­id depend­ing on the track in ques­tion - it’s clear that there’s a good bit of ener­gy behind his voice. That ener­gy, com­bined with the sharp­er side of Harrington’s voice, goes a great way towards giv­ing Les Savy Fav its edge. It’s not always suc­cess­ful; cer­tain parts of Root for Ruin end up much flat­ter than oth­ers, vis­i­ble in the con­trast between the ear­ly and late sec­tions of “Let’s Get Out of Here.” Still, Har­ring­ton is, more or less, quite suc­cess­ful at hit­ting the ide­al range between yelling and melody for Les Savy Fav’s style. Les Savy Fav is, it must be said, more about sound than words. All the same, the sad state of Root for Ruin’s lyrics can’t be ignored. When it comes to lyrics, Les Savy Fav relies more upon rep­e­ti­tion than inno­va­tion, and it clear­ly shows. Root for Ruin alter­nates between mediocre lines (usu­al­ly repeat­ed five or so times) and embar­rass­ing lines such as “Lips ‘n Stuff“ ‘s “My body is a book / And you’ve been thumb­ing every page.” The less­er empha­sis on lyrics light­ens the blow of this weak­ness, but it cer­tain­ly can’t erase it com­plete­ly. Root for Ruin opens with “Appetites,” a great exam­ple of a typ­i­cal Les Savy Fav track. While it clear­ly fol­lows a fair­ly stan­dard punk struc­ture, cycling through a num­ber of com­pli­men­ta­ry, short, heav­i­ly punc­tu­at­ed lines, it is in instru­men­ta­tion not very punk at all. The result is, as can rea­son­ably be expect­ed, quite inter­est­ing. Not only does Root for Ruin have a unique sound, but while one line may be repeat­ed quite a few times in a row, lines switch out with one anoth­er often enough that the band can keep a track inter­est­ing for its entire length (although that said, only three of the eleven tracks top four min­utes). This, how­ev­er, should not be tak­en to mean that Root for Ruin is par­tic­u­lar­ly good. Real­ly, it just isn’t par­tic­u­lar­ly bad. While only a few of the tracks can fair­ly be heav­i­ly crit­i­cized (think “Sleep­less in Sil­ver­lake”), noth­ing real­ly stands out as excel­lent. Sure, there’s the extreme­ly inter­est­ing “Pol­ter­geist,” which builds up about as much ten­sion as any­one can right­ful­ly stand before releas­ing it in a sur­pris­ing­ly suc­cess­ful Arcade Fire moment, but not much about the album is mem­o­rable, oth­er than its vague enjoy­a­bil­i­ty. The album throws quite a few sur­pris­es, but none of them are ground-shak­ing­ly bril­liant. Root for Ruin, in the end, is nei­ther excel­lent nor ter­ri­ble. Instead, it falls right around the mid­dle. Occa­sion­al­ly inven­tive instru­men­tals and sol­id vocals are coun­tered by mediocre lyrics and rep­e­ti­tion, such that Root for Ruin’s best ele­ments are, while still present, per­haps less clear than they could - and should - be. As such, Root for Ruin is a bit bet­ter than aver­age, but not enough.